A cake from a recent Fante’s beginner decorating course. Decorating is a perfect way to add a real personal touch to your next cake. And it’s surprisingly easy with the right tools and a little know-how! At Fante’s, we’re known for our cake decorating courses, which we’ve featured for over 50 years. For the last 30, they’ve been taught by the fantastic Deborah DiCintio Lang, a professional baker, caterer, master decorator, and winner of many awards. We caught up with Debbie for a short Q & A and some insight into the fabulous world of cake decorating. First things first – in order to decorate, you’ll need pastry bags. 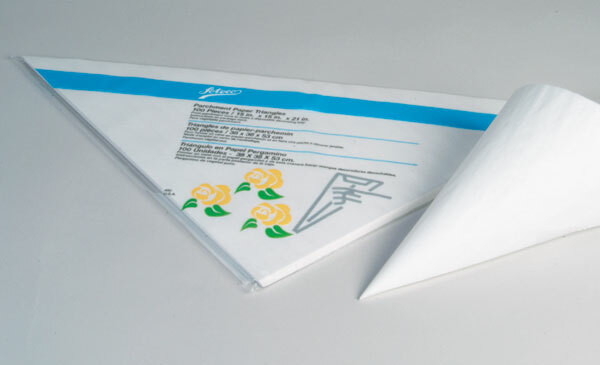 Used in conjunction with pastry tips, these bags are the key to quickly and evenly decorating cakes, pastries, muffins, cupcakes – well, anything! Most beginners stick to either plastic-coated or polyurethane bags, since they’re inexpensive high-quality options. You can’t really go wrong with either – the plastic-coated bags are a little easier to grip, but they’re also heavier and stiffer, so people with less hand strength tend to get better control out of the polyurethane options. If you’re looking for something really durable, you might want to go with the Wunderbag, the choice of many professionals, or a traditional canvas bag (which actually works best with non-greasy foods) . Debbie also loves the polyurethane bags. “They’re durable, easy to clean, and come in a variety of sizes”, she says. Let’s emphasize the “easy-to-clean” part – unlike a lot of pastry bags, the polyurethane models are dishwasher-safe if you put them on the top rack. Once you have a bag picked out, you’ll need to add a decorating tip. Tips allow you to make all sorts of different patterns – flowers, leaves, stars, basket-weaves, and a whole lot more. To use a tip, cut a very small portion (only about 1/4″ – remember that you can make it bigger but you can’t make it smaller) off the end of your bag, then just drop in the tip and push it firmly into place. 1. Tip 402, a large ruffle. “This one is great for garlands on the sides of your cakes”, says Debbie. 3. Tip 230, also known as a Bismarck tip, is essential for filling cupcakes and other pastries. Insert it into a pastry bag like normal and fill the bag with your favorite filling. Then just stick the tip into your pastry and squeeze. Voila! Filled cupcakes. 5. Tip 104, a petal tip, is “probably the most versatile pastry tip”. You can use it for all sorts of flowers – “from roses to forget-me-nots, pansies to daffodils”, gushes Debbie. It can even be used to pipe small ruffles and bows. Couplers allow you to change tips without having to empty your pastry bag. We’ll throw in one other tip – a piece of advice this time! If you’re doing a lot of decorating, you might want to pick up a few couplers. A coupler is an interlocking mechanism that holds a tip to the outside of a bag, rather than the inside, allowing you to quickly and easily change tips without having to change (or empty) the bag you’re using. Cake decorating is really fun, but it can be a business too! We asked Debbie if she had any advice for someone looking to decorate for a living. “Start by perfecting your skills”, she said. “Take courses in areas of weakness in your repertoire. If your forte is baking, but your decorating is sub-par, you may want to take a basic cake decorating course to make your wares more presentable.” Hey, we know a place that teaches basic cake decorating courses! “Most importantly,” she adds, “be willing to listen to your customer. Doing what you enjoy is definitely the aim in a business such as this, but doing what your customer wants is what will bring in the money.” Hear, hear. If you’d like a little taste of cake decorating, stop by the store this Saturday! Vanessa, staff decorating expert and baker, will show you how to properly fill pastry bags and use them to pipe out frosting. We’ll have mini cupcakes for you to practice on, and yes, you can eat them afterwards. If you can’t make it this weekend or want to learn more, check out our Cake Decorating Courses – you won’t regret it!